Harvest of cabbage will certainly please, if you know how to grow. Proper care will keep from diseases, get rid of pests, will help the plant get the necessary food elements. The cultivation of sprouts begins with soaking the seeds in mid-late March. Place them in a glass, put on his gauze and secure it with rubber bands or thread. Pour into the container of water whose temperature is +50oC. After 5 minutes drain it and fill the glass halfway with cool water. This technique will help to remove from the surface of the seed spores of dangerous microorganisms. Prepare a solution of a growth stimulant to 200 grams of water enough 2 drops. Pour it in a container with seeds. Let them absorb useful minerals. After 10 hours plant seeds in seedling boxes filled with fertile soil. Put them on the windowsill. When sprouts appear, keep the temperature at +15+20 ° C, so they are not stretched. 20 days raspakirati seedlings in peat cups. In early may, plant the seedlings to the garden. Cabbage does not like acidic soil. Make 1 square meter is 200 grams of ash. It will reduce the acidity. Make the holes generously spill their warm water, plant the seedlings and pricenice them. Shower every evening with warm water from a watering can. A week later, the seedlings take root. Okucia her, sprinkling the ground before the first true leaves. Don't forget plenty of water in dry weather. To do this, use only warm water. Cold can lead to the development of the disease "black leg". Each adult plant "drinks" the water bucket for the day, so pour abundantly. The morning after this podrujit the ground around plants to provide oxygen. The young plant harm cruciferous flea beetles. Periodically sprinkle each ash, which prevents their spread. If the soil is rich in organic matter, and you notice a fresh hole the size of 1-2 cm, it moves the mole cricket is a dangerous pest. Put it in every hole 2-3 granules of Midweeks" to a depth of 2-3 cm, pour water and sprinkle the soil. From the whitefly will help halves of the egg shell. Put next to the Kale sticks, put on the shells. Periodically inspect the back side of the leaves. If you have noticed yellow dots are the eggs of the whitefly. Collect them, destroy. Otherwise of them soon formed the voracious green caterpillars. If they appear, then collect them and also destroy. Care cabbage is not only copious irrigation, pest control, and fertilizing. 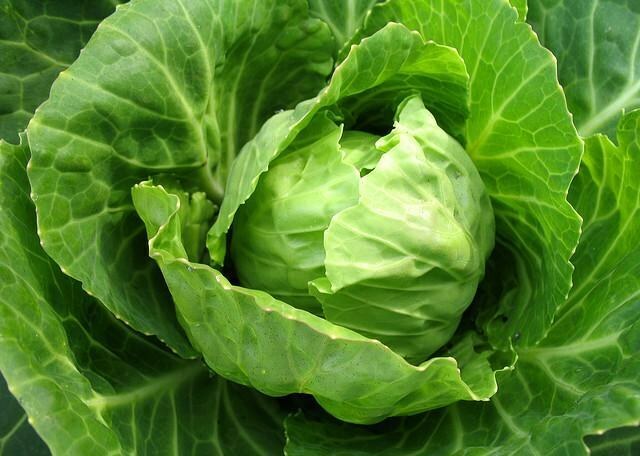 In the early growth fertilize cabbage nitrogen fertilizer every 2 weeks. To do this, put in a bucket of 600 grams of manure, pour 6 liters of water. Put the fertilizer in the sun for 2 days, then fertilize. Early varieties from late June, and late – mid-July start to feed potassium and phosphorus fertilizers. Pour into a bucket glass ash and a tablespoon of superphosphate, cover with hot water. After 3 days, give the plant a liquid feed. Remove the heads as they Mature, preventing them from cracking.